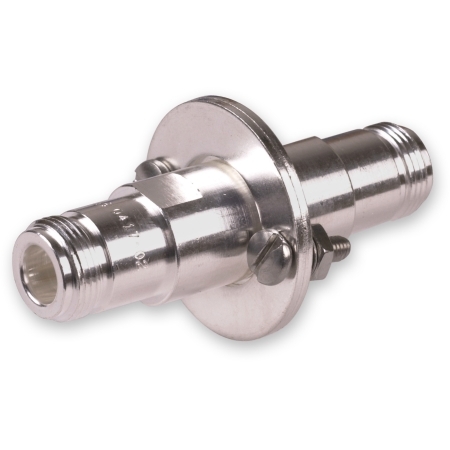 Bulkhead mounting coaxial protectors attach through a panel of maximum 1/4" thickness. Device is DC blocked to stop DC continuity and accommodate all equipment types. Handles 50 kA max. surge current. Turn on voltage is a nominal 600V for L series models and 1200V for H series. Device turns on 2.5ns (L series) or 7ns (H series) after reaching DC threshold. Multi-strike capability. Aluminum enclosure and stainless steel hardware. Choose the protector which has the lowest throughput energy for the desired frequency.